In a beautiful market town, sleepy villages or busy city centres, there is often a challenge to retain the original beauty of the Victorian, Georgian and even medieval building construction, particularly when it comes to windows. Frames Conservatories Direct offers secondary glazing to closely replicate the thermal and noise reduction benefits of double glazed windows while retaining the original look of the building. We work in harmony with the local building conservation officers making sure any recommendations we offer are consistent with their remit to keep character homes in character, yet improve on the energy efficiency of the homes. Energy and cost efficient, reducing the heat loss that comes from single glazed windows while keeping you comfortable. Reduce obtrusive street clatter and achieve significant levels of noise reduction and sound proofing. Adding a secondary glaze offers an additional barrier of protection for your home that can’t be opened from the outside. Secondary glazing is not subject to Conservation Restrictions and is generally recommended and approved for listed buildings. Eliminate or drastically reduce the onslaught of dust, pollen and other airbourne pollutants. Low Hassle, Low Stress, High Quality. 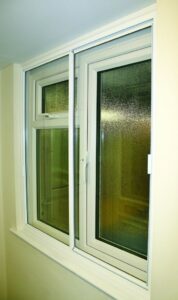 We fit sub-frames inside the window reveal and then fit a secondary glazing unit, making sure the structure of the windows’ horizontal and vertical bars are mirrored so that from an external view the secondary glazing units are not seen. We have a wide range of styles to suit any application. It’s technical, but we guarantee you will be happy with the final result. To see how our secondary glazed windows could transform your home, please fill in the online quote form and we will contact you as soon as possible. Or you can ring us now on 0800 2 800 472.